These amazing reptiles are one of the largest in the world. They can reach a weight of 500+ pounds. Galapagos tortoises live on islands about 600 miles off the coast of Ecuador, South America. Conservation Status: Considered to be facing a high risk of extinction in the wild. Of the 13 known species of Galapagos tortoises, only 11 are left today. Lonesome George is the last of the Pinta Island species. His home is the Charles Darwin Research Center on Santa Cruz Island. 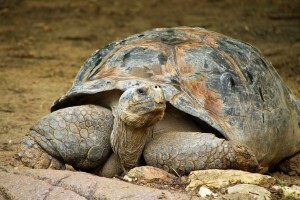 Galapagos tortoises do not reach their full size until they are 40 years old.